Lawrence Harvey Zeiger more popularly known as Larry King was born on November 19, 1933 in Brooklyn, New York. He was born to mother Jennie Gitlitz and father Edward Zeiger. His mother was a garment worker while his father was a defense plant worker and a restaurant owner. His parents were originally Jewish but emigrated from Belarus to Brooklyn and conceived Larry. When King was nine, his father died of a heart disease which took a great toll on him. This eventually affected Larry’s performance in school and eventually ruined his chances of going to college. At the time his mother was forced to go on welfare to further support Larry and his younger brother. When Larry graduated from high school, he began working in order to help support his mother. From an early age King knew he wanted to go into the field of radio broadcasting. King had met a CBS announcer that advised him to go to Florida because there was a growing media market there so King took a bus to Miami. May 1, 1957 marked his first broadcast, starting from 9 am to noon including an afternoon newscasts and sportscast which paid him $55 a week. When the general manager had difficulty to remember Larry’s last name he started to refer to him as King which he took from an ad in The Miami Herald for King’s Wholesale Liquor. Soon after he started to do interviews on a midmorning show for WIOD at Pumpermik’s Resaurant in Miami Beach where he would interview anyone who walked in. his first interview was with a waiter at the restaurant and two days later singer Bobby Darin, King’s first celebrity guest, who was in Miami for a concert later that day. The Miami radio show launched him into local stardom. In May 1960 he hosted Miami Undercover on WPST-TV Channel 10 (at that time) where he debated on important issues of the time. Later on King was dismissed from the stations he worked with and lost his weekly column at the Miami Beach Sun, due to his arrest for grand larceny. The charges were eventually dropped on March 10, 1972 and King would spend the next several years reviving his career. Later on he became a color commentator for broadcasts of the Shreveport Streamer of the World Football League which propelled him back into radio. In 1978 WIOD rehired King and he went on to be a prominent all-night national radio broadcaster. King had a program that would interview his guest for the first 90 minutes and allow the callers to continue the interview for another 90 minutes. By 3 am he would allow the callers to discuss any topic they pleased with him. In 1985 he started to host the nightly interview TV program Larry King Live on CNN which has since dominated the airwaves. King has also won an Emmy Award, two Peabody Awards and ten Cable ACE Awards. 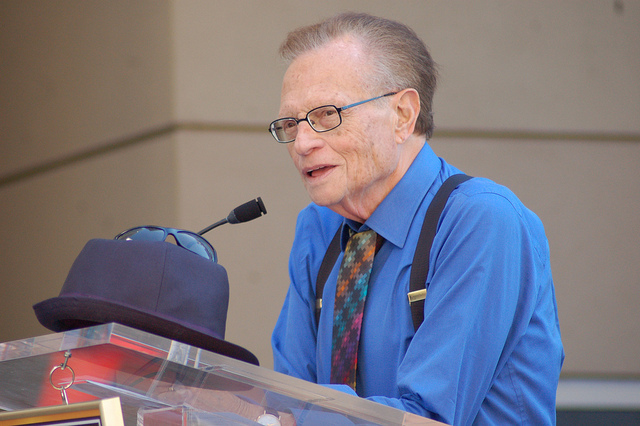 Larry King has become one of the United Stated most premier broadcast interviewers and it is reported that he has conducted about 40,000 interviews throughout the course of his career. This includes many influential persons such as politicians, athletes, entertainers and other newsmakers. For almost 20 years, King has also written in a newspaper column in USA Today from 1982 to 2001. King has also written two books Mr. king, You’re Having a Heart attack: How a Heart Attack and Bypass Surgery Changed My Life and Taking Heart Disease: Famous Personalities Recall How They Triumphed over the Nations #1 Killer and How You Can Too. Larry King has five children; three are adults from previous marriages and the two younger children, Chance who was born in March 9, 1999 and Cannon born on May 22, 2000. King has been married eight times to seven women. On February 24, 1987, King suffered a major heart attack and had to do a quintuple-bypass surgery. It happened a day after taking over the Don and Mike Show. Since then he has not smoked.